250g Weight-Bearing: Features with a powerful neodymium magnet and silicon center, it can bear most smartphones. Arbitrary Swivel: No matter how you rotate your phone, this primecables mount holder guarantees that your phones will remain in your preferred position. Widely Use: With the adhesive base, the holder can be stuck on the desk, in the car, on the wall, or anywhere you find convenient. No worries of falling. Security: No wobbling, no slippage-this phone mount can firmly hold your phones in place while driving. Two Magnetic Plates: Provides two magnetic plate which takes tiny space and holds your device very firmly with high magnetic intensity. Overview Effortless Installation：Just put the mount holder on the car or the place you want, it will get stuck firmly. 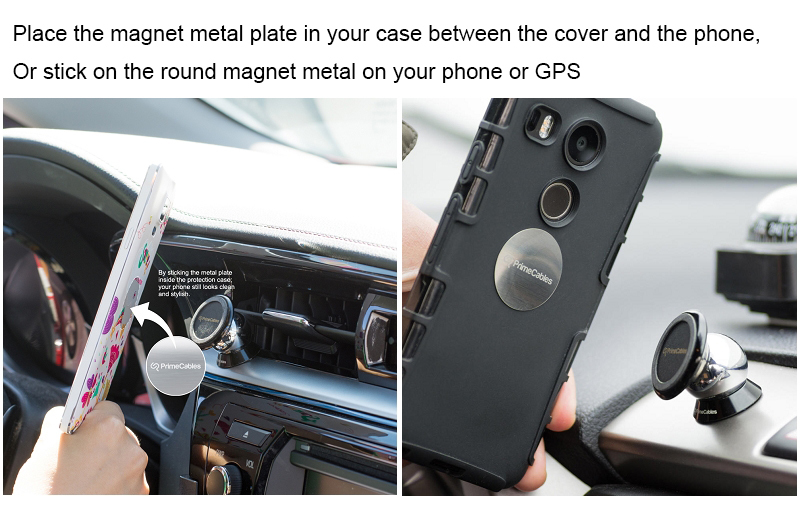 Then the powerful magnetic plate can hold your smartphone safely. More Than A Holder：Primecabls Magnetic Mini Mount Holder can also be used as a kickstand to hold the device in place on a flat surface. Sleek：The high quality 360-degree ball mount allows you to adjust to any angle, so you can always keep your phone fully in view. Please Note：The 3M adhesive stuck on the holder is disposable, which means it can only be used once. The product comes with two more 3M adhesive tapes, so please find a right position before fitting it.